Puzzle games do not have to be overly complicated to maintain player focus. Even the simplest of puzzle games can be extremely enjoyable and fun. Flowlines VS is a very simple concept that is much more colourful in execution. 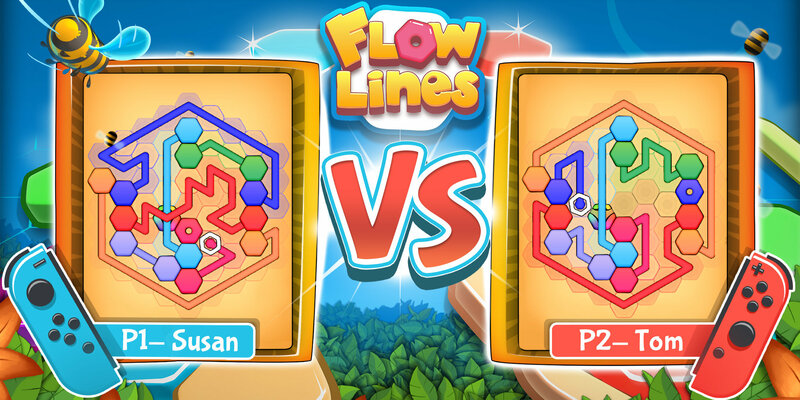 Flowlines VS is a classic puzzle game developed by Baltoro Games. The development studio was founded back in 2008 and has branches in Kraków and Tarnów in Poland. Their primary development was for games in the mobile market and have since expanded onto console games development. Their most successful game was Adrenaline Rush – Miami Drive on iOS and Android. It has gained worldwide recognition and fans all over the world adore it. Flowlines VS is a very easy to pick-up-and-play puzzle game that one or two players enjoy. The idea of the game is to join up the coloured Hexagons called sockets, with their pair by drawing a line from one to the other. You have to use up all the spaces on the grid in order to complete the puzzle. The first few puzzles are relatively easy and the game gets gradually harder as the player completes more and more levels. There are over 400 challenging levels to play in single player mode and each will test you in different ways. Every now and again, new mechanics are introduced to add more variety to the game, allowing players to use different strategies when trying to complete levels. Some game mechanics include a rainbow coloured hexagon that can be joined to any other colour. Bridges allow lines to cross over a single space and can take up to three different coloured lines. Walls create obstructions that limit where a particular line can go. Every now and again, players will also be given a move or time limit to work against to make the levels more challenging. In two-player mode, players can compete against each other to complete their grid quicker than the other. There are three set grid sizes to choose from as well a random option. You can set the match point to 5, 10 or 15 and the winner of the game is whoever reaches the set matchpoint. There are only three controls needed to play Flowlines VS. The A button or the right arrow button (or X button) in the single Joy-Con play is used to accept, click on or unclick. The B Button or down arrow button (or A button) in single Joy-Con play is used to go back. You can move around using the left analog stick. Touch-screen play is also available for those that prefer to physically, run their fingers across the screen to join up each socket. While I appreciate the option to be able to do that, I found that my fingers are too big and obstruct my view of where I wanted to draw my lines. A stylus on the other hand, would be much more efficient and less screen obstructive. Players are awarded a three star rank if they complete the puzzles without making a mistake. If only one mistake is made, players can get a two star rank. If you are having a lot of trouble on a particular level, but eventually complete it, you will only get a one star rank. Though it is not essential to complete every level to three star rank, doing so can earn achievements if certain prerequisites are met. Flowlines VS is a very bright and colourful game. The visuals are simple yet elegant and it looks great both in handheld and docked mode. It runs smoothly as well as there are not too many factors for the CPU to deal with. I hardly noticed any performance drops if any and loading between levels is extremely short. The music and sound effects are very simplistic but they do their job. The music is mildly entertaining and more often or not, I was so engrossed in playing that I wasn’t even paying attention to it most of the time. The sound effects like joining up the hexagons are very much like what you would hear in most mobile puzzle games these days but it does feel strangely satisfying when you make a successful connection. Flowlines VS is interestingly addictive. I kept telling myself at times “Just one more level and I am done,” 40 levels later and I am still telling myself “Just one more level.” It’s gameplay is short and sweet but there are plenty of levels to engage yourself with to guarantee hours of fun. The multiplayer mode is a lot more competitive and fun to play as you both race to beat the other. A couple of drawbacks that I found is that it is very easy to accidentally, move the Joystick in the wrong direction. It can be sensitive as there are not just horizontal or vertical directional movements but diagonal as well. It is not a problem if you are not worried about getting all three stars on each level. If you are more preoccupied, it can be aggravating at times, as you will have to start the level again if you are aiming for perfection. Another issue can be the colour of the hexagonal sockets themselves. Some colours are very similar to one another and anyone with a slight degree of colour blindness may have trouble distinguishing one pair of sockets from another. Though most of the blue and green coloured sockets are easily recognizable, the variants of the pink sockets can be a bit difficult to distinguish from each other. It isn’t a deal breaker but it might be a deterrent for those who are colour blind. Flowlines VS is a traditional puzzle game that is fun to play. Easy to pick up, difficult to put down. Whether alone or with friends, you can test your analytical prowess, especially when against the clock or other players. It is bright, colourful and charming game that you will not want to part from for too long and whilst it is ideal to play in short bursts, you can easily lose yourself in the many levels that it has to offer and play for hours on end.